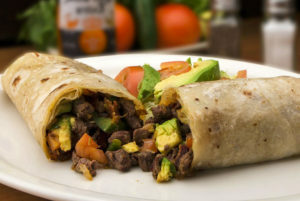 Caution: this blog post might make your stomach growl a little louder than usual! Food is a major part of travel. 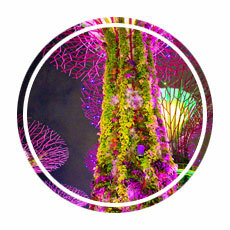 At a minimum, it gives you the energy you need as you tackle long days and packed itineraries. For us, it’s a vital part of our experience. 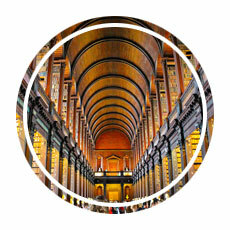 We love to explore new places through the types of food the locals enjoy. That includes our own backyard: the United States of America. We have visited all 50 states, and we have experienced dozens of delicious, iconic meals. In fact, we have often made it our mission to seek out traditional American food that is widely considered representative of a region. There’s usually a (delicious) reason why a certain type of food is associated with a city, state, or region! While this is not a definitive list, it does include a lot of our favorites. If you are planning to visit any of these regions, don’t miss out on trying their featured menu item. We hope this list will help you on your culinary adventures! I grew up in the USA’s Northeast, so when I think of these foods, I think of home. You probably could have guessed this would end up on a list of American food, and although you can find lobster all over the world it’s most famously sourced off the shores of Maine. 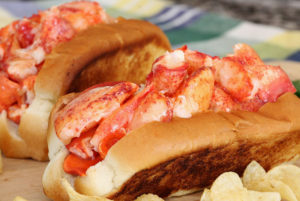 Growing up, enjoying a lobster roll on the beach was a sign that school was out for the summer. Today, lobster is certainly more of a special occasion treat, but when you visit the Northeast it’s worth the splurge. Red’s Eats in Wiscasset, ME is famous for serving delicious lobster rolls- join the long line and know it’s worth the wait! As a Bostonian, I have to insist there is only one kind of clam chowder: the white, cream-based kind. It’s popular around the country, but a visit to New England almost necessitates that you start a meal or two with a cup of “chowdah.” If you visit Rhode Island or New York you will likely find the tomato-based version on the menu. I’ll admit that one is good, but given the choice you can’t go wrong with traditional New England clam chowder. Legal Sea Foods hasn’t changed their clam chowder recipe in almost 40 years- it’s always tasty, and you’ll find locations all over the country. One of my favorite childhood memories is of blueberry picking under the warm Maine sun. My grandmother would take me to one of the many “U-Pick” blueberry farms in central Maine, and we would spend a whole afternoon filling cartons to take home with us (and, of course, sneaking the occasional berry as an immediate treat). That evening, she would convert our haul into delicious blueberry cakes that would melt in my mouth fresh from the oven. July is Blueberry Month, so if your travels take you to the Northeast in mid-summer, you’ll be rewarded! 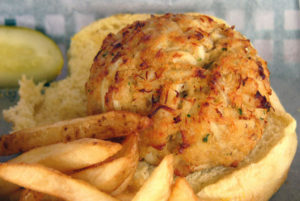 Most notably found in Rhode Island, clam cakes are a little bit like donuts. Often served alongside chowder or as finger food, they are made of chopped clams and batter that is deep-fried. They are a tasty snack that is pretty popular in that part of the world, especially on the coast! The clam cakes at Hemenway’s in Providence, Rhode Island are very nicely prepared. If you don’t make it south to Narragansett or Newport, you can still try authentic clam cakes in Rhode Island’s capital. Pizza in itself is pretty iconic in the USA, but a slice of New York pizza is almost a right of passage when you visit the Northeast. Often characterized by large slices that can be folded in half to eat, you’ll find it throughout New York, New Jersey, and Connecticut. Adam and I have both been to John’s Pizzaria in New York City (the Times Square location), and despite going separately we both loved our experience- the pizza is delicious! Whenever I’m in New York, I get the impression almost everyone starts their day with a bagel and cream cheese. There really does seem to be something in the water; bagels that are boiled in Brooklyn water just taste better to me. I order mine with lox, tomato, capers, and onions; in fact, no visit to NYC is complete for me until I have had a New York bagel. You have probably enjoyed a buffalo wing or two at a bar or during a Super Bowl party, but if you’re driving through upstate New York it makes sense to enjoy an order of wings in the city that gave them their name. Widely believed to be created at Anchor Bar in Buffalo, this tasty snack is certainly an icon of the Northeast! It’s been a while since we last visited the Southwest, but there are some memorable meals to be had in that part of the country! There is nothing else quite like a freshly roasted Hatch green chile. Grown in New Mexico’s Hatch Valley, these peppers can range a bit in spiciness, and they can be enjoyed on their own, as a sauce, or even on a burger. While we love Hatch green chiles the most, you’ll find red chiles in New Mexico as well—in fact, when you place an order in a restaurant, you’ll often be asked, “Red or green?” to determine your chile preference. If your travels take you to Albuquerque, New Mexico, try a fiesta burger with green chile at the Frontier Restaurant. Frybread is deeply rooted in Navajo tradition; developed out of necessity when Native American tribes were forced to relocate to the Southwest, it remains a common dish (although what we find in restaurants can be different from how it is prepared within a tribe). A common variation is the Najajo taco, which is frybread topped with ground beef, tomatoes, sour cream, or other typical taco filings. The official state meal of Oklahoma actually resembles wiener schnitzel: it’s a piece of tenderized steak that is breaded and fried. While it’s typically served for lunch or dinner, you’ll also find it on breakfast menus from time to time. Our home is now in the USA’s Mid-Atlantic region, and we have no shortage of delicious foods to try! One of the true Washington, DC foods, half smokes are a right of passage in the nation’s capital. Half pork, half beef, and all smoked before grilling, you can top them with anything from ketchup and mustard to chili and cheese. We have to recommend the chili version, though: it’s a true DC tradition. Don’t miss Ben’s Chili Bowl, a DC institution that has served half smokes to locals, tourists, celebrities, and politicians since 1958. A proud product of the Chesapeake Bay, fresh blue crab is one of the best parts of living in (or visiting) the Mid-Atlantic. Known for their sweet taste, these crabs are the basis for the best crab cakes you will find—although they are just as delicious when served by the bucket on a paper-lined table! We love Cantler’s for fresh crabs, crab cakes, and cream of crab soup. Grown in Virginia’s southeastern region, Virginia peanuts are sometimes known as ballpark peanuts. They tend to be large, and they make a great choice for homemade peanut butter. While you’ll easily find gourmet Virginia peanuts, especially in gift shops, look for them in soup—yes, soup. Peanut soup is a delicious regional specialty that’s worth tasting if you can find it! If you want to try peanut soup, Gadsby’s Tavern is a beautiful, historic restaurant in Alexandria, Virginia that serves an authentic recipe. Virginia is fairly well-known when it comes to ham, and ham biscuits are a tasty and portable way to enjoy it. You’ll find a wide variety of interpretations, but the best ones are simple: fresh biscuits topped with sliced ham and a little bit of mustard. If you visit Philadelphia, make a point to try a cheesesteak. These sandwiches made from thinly sliced beef and cheese on a long roll are delicious. There are two famous places to order one— Pat’s and Gino’s— so if you’re in the city for more than a day (or you’re just really hungry!) order one from each establishment and decide which you like more. While American and Cheez Wiz are the most popular cheese choices, I order mine with Provolone. OK, this isn’t a food you’re going to find on a menu, but you’ll find plenty of meals featuring this seasoning created in Maryland. Most commonly served on seafood (especially crab! ), Old Bay is so popular you’ll find it served with popcorn, potato chips, corn on the cob, and baked potatoes. Old Bay is fairly versatile—we especially love it on salmon! My very first business trip was a road trip through several of the Plains states—and in between meetings I learned this part of the country serves some delicious food! No self-respecting list of American food could leave off steak. 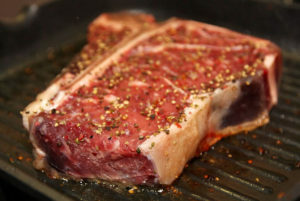 No matter how it’s prepared, red meat eaters will find the Plains states to be paradise when it come to finding and savoring a nice, juicy steak. With many cattle farms located in this region, you’ll find plenty of great restaurants serving your favorite cut. An alternative to the more commonly consumed hamburger, bison meat is leaner and more tender than its counterpart. Americans have been slow to accept bison into their diets, but if you enjoy a good burger and haven’t tried bison you’ll be surprised by just how flavorful it is. I know, there’s a lot of red meat in this section, but we would be remiss if we didn’t mention this dish—especially since the name suggests you should skip it. Burnt ends are now considered almost a delicacy by barbeque lovers, especially in Kansas City, where the fatty ends of beef brisket are covered in sauce and served with a few sides. Texas Chili is both very simple and remarkably complex all at the same time. The ingredients list is what keeps it simple: beef, chili paste, and seasonings. The preparation, though, requires mastering an art form: choosing just the right balance of ingredients and cooking it just long enough for the beef to become tender and the spices to combine. Properly done, Texas Chili is hearty and filling. Adam originally hails from the Great Pacific Northwest, and we’ve had some great meals when we visit! If you enjoy fish, the waters off America’s northwestern coast won’t disappoint. 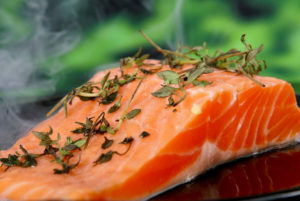 Look for salmon and sturgeon, which are commonly fished in Oregon and Washington. Served as fillets or even in fish chowder, fish is likely to turn up on most menus along the west coast. If you’re in Portland, try Jake’s for great local fish, crab, and crawfish. This kind of crab can be served as a crab cake, but we think it’s best on its own—Alaskan king crabs are maybe best known for their flaky, sweet taste, and they can be eaten right out of the shell. Make sure you are hungry when you try them—some crab legs can weigh an entire pound! Alaska isn’t the only crab-producing state in the Northwest! Our favorite Dungeness crabs are found in Washington- steamed and served with some melted butter they make a great local meal. Summer in the Northwest means marionberries, an American food that might not be familiar to you. A type of blackberry, marionberries are native to Oregon and are among the sweetest and juiciest blackberries you will find. Commonly served in pies, jams, milkshakes, or just on their own as a snack, you won’t want to miss trying them if you visit during marionberry season. Have you ever eaten an onion like an apple? Walla Walla sweet onions are so mild you might consider doing just that—and some people do! We prefer them in the form of onion rings, though, and during the summer in the Northwest you’ll find plenty of restaurants preparing them that way as well as incorporating them into plenty of other recipes. Believe it or not, our favorite Walla Walla sweet onion rings come from Burgerville, a pacific northwest fast food chain. They are seasonal, but if you see them they are worth a trip through the drive-thru! Sour-style dough was once thought to be specific only to San Francisco, where bakers were baffled when the dough they made elsewhere in the world took on a distinctly sour taste in the Bay Area. While we now know just what type of bacteria causes sourdough to be, well, sour, this type of bread is a local and national favorite, but it’s best enjoyed during a trip to California. This dish, which is a tomato-based seafood stew, is often made with the catch of the day and is particularly popular along the California coast. It’s light but filling at the same time (and pairs well with sourdough!). Hawaii has an incredible diverse culture, and along with it they serve meals that have become true American food classics. A trip to Hawaii often means enjoying a luau, and with that will come a huge meal with a kalua delicacy. Kalua means to cook in an underground oven, and food prepared in this way is often slow-cooked for 6-8 hours in a hand-dug oven warmed by rocks that have been heated by flames. Kalua pig is the most common meal served in this style. 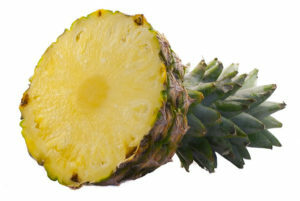 Pineapples aren’t native to Hawaii, but they are practically synonymous with the island state these days. Introduced in the 1900s, pineapples grow well there, and enjoying fresh pineapple is almost a requirement when you visit. Visit the Dole Plantation to both learn about the history of pineapples (and the Dole family) and try Dole Whip, a fantastic pineapple soft serve dessert. For fish lovers, poke is a great choice. Combining cubes of raw fish with soy sauce, sesame oil, and seasonings, it’s a great, light island meal. While poke can be found throughout the USA, it is most authentically served in Hawaii. Hawaii’s favorite dessert is a truly unique find. Made from incredibly thinly shaved ice, shave ice—that’s right, there’s no ‘d’ at the end of shave—has the consistency of soft, freshly fallen snow. With the addition of flavored syrup, it becomes a sugary concoction that makes for the perfect after dinner treat. Ululani’s Shave Ice was exactly what we were looking for- and with about 50 flavors to choose from, you’ll have no trouble finding something you will enjoy! A native Hawaiian dish, laulau is meat or fish that is wrapped in luau or taro leaves before being cooked in an underground oven. These days, laulau can be steamed above ground on a stove with the same results, but it remains a popular lunch and is worth a try if you’re looking for a different type of American food. The South serves some of the most recognized American food around—there’s a reason why it’s famous! You’ll find BBQ all over the USA, but our favorite comes from the South. Two popular styles are Carolina and Memphis. Carolina BBQ has more of a vinegar base, which creates a thin but flavorful sauce to coat pulled pork or chicken. Memphis BBQ often means ribs (served wet—coated with a sauce—or dry—cooked with just a spice rub), although BBQ sandwiches with chopped pork are also a delicious way to try Memphis barbeque. No matter which style you choose (and we recommend trying them both! ), BBQ is without question an iconic American food. One of our favorite side dishes in the United States is fried green tomatoes. It’s a straightforward dish; green tomatoes are sliced, coated with a cornmeal batter, and lightly fried. We especially love them with pimento cheese, and they are also tasty in sandwiches (try substituting fried green tomatoes in a BLT- it’s delicious!). 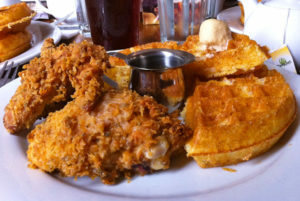 A southern soul food breakfast will often introduce you to chicken and waffles, a culinary delight that pairs fried chicken with a crisp waffle, all served with butter and maple syrup. The combination may not sound appealing, but properly cooked the flavor profiles compliment each other so well you might be tempted to replace bacon or sausage as a typical waffle side dish! Visiting Louisiana will introduce you to Creole cooking, where gumbo, jambalaya, and red beans and dirty rice will show you a different side to American food. Creole food isn’t typically that spicy (unlike it’s Cajun counterpart), but it is hearty and rich and very much engrained in Southern cuisine. Try Muriel’s Jackson Square for contemporary creole cuisine in New Orleans. A trip to Florida—especially Miami—will likely ensure you cross paths with the Cuban sandwich. A tasty combination of ham, pork, Swiss cheese, pickles, and mustard, the origins of the sandwich are disputed: people argue over whether it was invented in Miami, Tampa, or Havana. That question may never be answered, but it is permanently rooted in American food history. Key lime pie is without question an American dessert. Made from tiny, Florida-grown key limes, the pie filling sits on top of a pie crust and underneath a layer of sweet meringue. You’ll often find it on dessert menus in the South. You won’t want to miss these tasty meals on a journey through the USA’s Midwest! If you like cheese, make sure Wisconsin is on your foodie bucket list. Wisconsin is known for it’s cheese production, and you’ll find no shortage of dairies and markets where you can sample them. 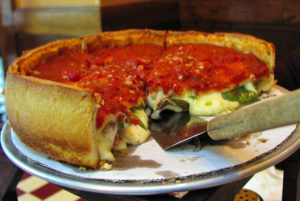 Very different from what you’ll find in New York, deep dish pizza is associated with Chicago, where a thick crust loaded with chunky tomato sauce and cheese make for an unforgettable meal. These tasty filled dumplings are consumed around the USA, but it seems the Midwest is fondest of them. Pittsburgh especially has adopted the eastern European favorite as their own, and you’ll find pierogies as both an appetizer and a main dish throughout the Midwest. 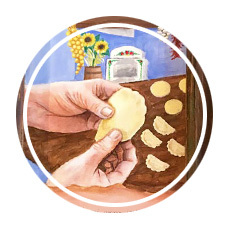 Visit Church Brew Works in Pittsburgh, Pennsylvania to try both traditional pierogies as well as the daily selection of “untraditional” pierogies, which have less conventional fillings. While the specific creator of the Juicy Lucy is disputed, its place as an American food classic is not. The Juicy Lucy takes a hamburger and fills the burger patty with cheese, which creates a kind of molten cheese core that also keeps the patty, well, juicy. Also disputed is the proper spelling of this burger: the 5-8 Club in Minneapolis spells it traditionally, while Matt’s Bar omits the “I,” instead calling it a Jucy Lucy. No matter where you go—or how you spell it—it’s definitely tasty! The Midwest loves Cincinnati chili, which is ground beef simmered in Mediterranean-influenced spices as well as cinnamon, which gives it a sweeter taste than most chili fans are used to experiencing. While it can be enjoyed alone, it’s often paired with pasta or on top of a hot dog. Order it using the “way” system, which calls out ingredients you can include using a specific series—two-way gives you pasta with chili, where five-way also includes cheese, onions, and beans. Like a hot dog with ketchup? Don’t mention that in Chicago. Instead, order a Chicago dog with all of the toppings: yellow mustard, onions, pickle relish, a pickle spear, tomatoes, peppers, and celery salt piled high on a hot dog served in a poppy seed bun. It sounds like a lot—and it is—but the flavors combine to create a delicious, iconic meal. An Ohio favorite, buckeyes are basically peanut butter fudge dipped in a rich chocolate coating. They are especially loved in Ohio because they resemble buckeye nuts (the state tree of Ohio), but regionally they are an exceptionally popular treat. There’s no way to create a definitive, complete list of American foods without leaving off a few favorites. Because we focused our list on regions, some universally iconic dishes like apple pie, corn on the cob, biscuits and gravy, the club sandwich, and eggs benedict didn’t make this list at all since they aren’t commonly consumed in a single region. They receive an honorable mention, of course. We also stayed away from including drinks since we’re planning to write about that in a separate post down the line. We would love to hear which foods on our list are among your favorites—and which foods you can’t believe we left off. 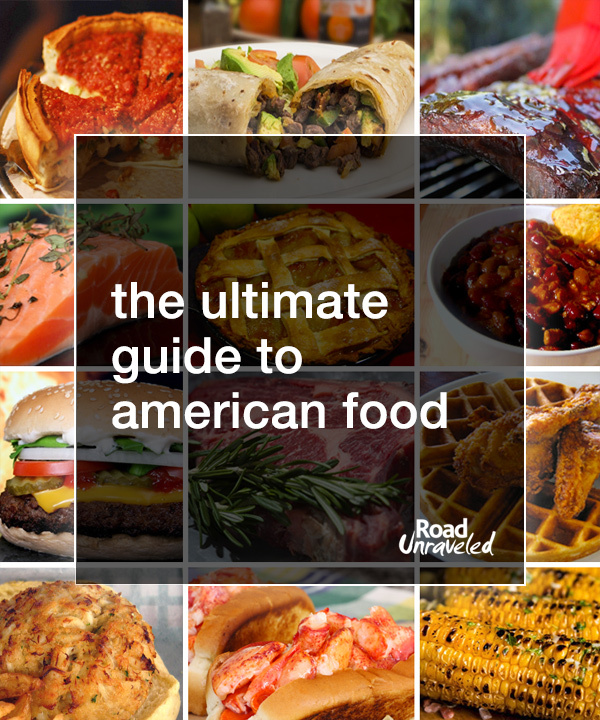 No matter what, we hope this list has left your mouth watering and inspired you to try some new American food on your journeys through the United States! If you love great food, here are a few more articles about some of the best meals we have had around the world!